Mario Kart is easily one of Nintendo’s biggest franchises, absolutely nailing the local multiplayer gameplay and providing an easily accessible experience for all to enjoy. It stands as a cornerstone of Nintendo’s portfolio and plays no small part in selling new hardware for the company; there’s a reason Mario Kart 8 Deluxe launched as early as possible on the Switch. As part of its ongoing series, Nintendo recently published an interview with the developers of the original Super Mario Kart, and interestingly enough, the game could’ve easily taken a much different form. The initial idea for the game was to make a two player F-Zero. However, due to hardware limitations, they couldn’t design F-Zero tracks that would work with two players and still fit within the hardware restrictions, so winding, meandering courses were made to fit the console’s memory. This led to a slower pace for the game overall—which is where the karts came in—and the development team soon added in Mario because he was easily recognizable from the back. It’s an interesting interview to be sure, you can find the full thing here. What do you think? 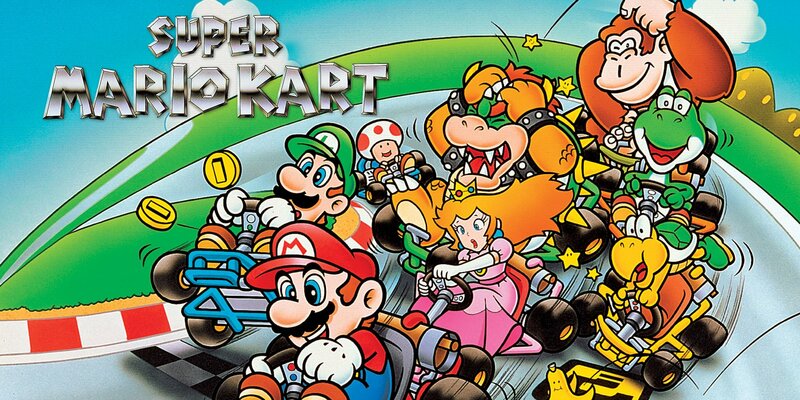 What’s your favorite Mario Kart? Share your thoughts in the comments below. From one of Nintendos least popular series, to the best selling franchise they have. Life's funny sometimes. ...so Nintendo would have forgotten it existed? 600 - 999 cc ?? I'd prefer an F-Zero 2. Even with the re-releases, it's a shame split screen is never added. At least do a special remix version because even on portable devices there's no multi-player option. You need to get original hardware, multiple copies of the game and link cables to for that. Best MK is DS. It had the perfect balance of driving and weapons - and some brilliant tracks. Then DD, 7 and 8D. I guess Mario kart wii would be my favorite since it was always the one I’d play with my friends with. Devil May Cry was originally going to be made as Resident Evil 4, but was allowed to break away from the Resident Evil series to become its own thing. Quake was originally going to be made as an RPG akin to Dungeons & Dragons, but latter became a DOOM clone. It is not uncommon for games to change during development. They mentioned this in Retro Gamer's excellent history of Mario Kart piece earlier this year. So even back then they were screwing over the F-Zero franchise. I distinctly remember hearing this before. It'd certainly be interesting to see how things could've gone if it wasn't for the SNES's technical limitations. Like would F-ZERO still be around if Mario Kart wasn't a thing? As interesting as pondering such a question may be, there's no sense in doing so. At the end, I'm glad things turned out the way they did. With Mario Party pretty much out of the picture, Mario Kart is definitely the most played local multiplayer series in my household with MK8D being the whole family's favorite. Just bring back F-Zero all ready! And don't anybody mention fast racing neo! @Owaynott FAST Racing Neo! FAST Racing Neo! FAST Racing Neo! FAST Racing Neo! It's amazing how much things changed just one console generation later.In the first oone they could just do single player with eight vehicles at the same time.While in the sequel they could do 2 players with 30 vehicles at the same time. Favourite Mario Kart for me is still Double Dash. Some non-gamers in my family who couldn't grasp the mechanics of driving games enjoyed taking the literal back seat. I do hope we get that game again one day on the vc. Mario Kart 8 Deluxe is probably objectively the best in the series though. My favourites of the series are N64, Wii, 7 and 8. F-Zero has done all it can do without being the same thing over and over again. That's why it hasn't been done since the GameCube entry. I think the best they could do is an HD remaster, featuring tracks from the SNES and N64 games. With all the racers from GX. Still the best Mario Kart in my mind, in terms of the tighter handling, tighter smaller tracks and the requirement of more skill than luck. If only they would make a 're-mastered' version for Switch which uses the same mechanics and similar track design, but is full screen, has new tracks, 4 player local multiplayer and online multiplayer. I would love that. One can dream. Mario Kart Wii, DS and 7. Had the most fun with Wii. Currently though 7 and older feel outdated so I'm most likely on 8, but I enjoyed the others more in their time. I'd have to buy a Switch if they did that. Late night portable online matches with Mario Kart DS is still one of my gaming highlights of late 2005. Mario kart deluxe is my all time favorite. I dont know what else they can add to the next mario kart to make iy feel fresh and new. Not just an upgrade. I would love to see a Super Mario Kart 2, with online capabilities and new tracks and characters, but retaining the gameplay of Super Mario Kart. The same goes for F-Zero! No offense to Mario Kart but I honestly would have taken F-Zero 2 over it, especially with a split-screen 2 player mode. I've always thought F-Zero was the superior pure racing game of the two (although I still love Super Mario Kart too). @JohnnyC I love double dash! Me and my brother had a blast with it. I thought this was fairly common knowledge at this point. We knew this a long time ago. lol well they just waited until MK8 for it to replace Fzero. Double Dash is the best. My brother and I ruled played co-op with me driving and him gunning. Probably my favorite co-op game and fondest co-op memories. Nostalgia speaking I love Mario Kart 64 but my favorite really has to be MK 8 DX. It's just so consistently good! I love the maps, music and mechanics. Sounds obvious but new Tracks? Double Dash! Co-op was great AND IT HAD PETEY AS CHARACTER! BRING PETEY BACK! MK8 has been awesome as well. ....I actually injured myself when playing MKW. Superman 64 was originally going to be an open world game, but was drastically changed because they were being held back by DC and Warner Bros. In other words, the game was supposed to be GOOD, but thanks to greedy companies letting the protection of their IPs take priority over actually making a good game, we have this sorry excuse for a Nintendo 64 game.